From the Book Jacket: You've likely heard of the historic Apollo 13 moon landing. But do you know about the mathematical genius who made sure that Apollo 13 returned safely home? As a child, Katherine Johnson loved to count. She counted the steps to the road, the number of dishes and spoons she washed in the kitchen sink - everything! Boundless, curious, and excited by calculations, young Katherine longed to know as much as she could about math, about the universe. From Katherine's early beginnings as a gifted student to her heroic accomplishments as a prominent mathematician at NASA, this is the story of a groundbreaking American woman who non only calculated the course of moon landings but, in turn, saved lives and made enormous contributions to history. Why It's On My Bookshelf: I've been using more and more biographies the past couple years when I'm teaching kids growth mindset. 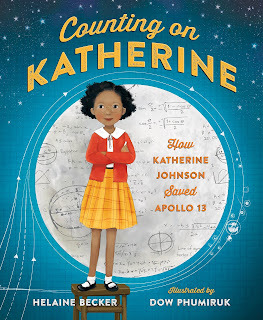 Counting on Katherine was a great story to share with the kids. Our students are really inspired by true stories and they learned a lot about the life of Katherine Johnson. This is about a woman who never gave up her dreams. If you loved the movie Hidden Figures - I highly recommend this book. You will learn even more about the obstacles she overcame and her DETERMINATION.